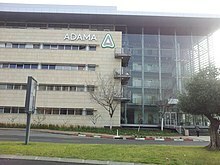 Adama Agricultural Solutions (Hebrew: אדמה פתרונות לחקלאות‎), stylized ADAMA, is a manufacturer and retailer of crop protection products with its headquarters in Airport City, Israel. It is owned by Sanonda, a subsidiary of ChemChina, which gained 100% control in 2017. It is traded on the Shenzhen Stock Exchange. Adama primarily produces crop and protection products. 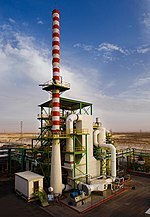 Agan was founded in 1949 as a cooperative, while Makhteshim was created in 1952. In 1973 Agan and Makhteshim partnered to distribute their products and 24 years later merged to form Makhteshim Agan Industries Ltd. In October 2011 ChemChina acquired a 60% stake in Makhteshim Agan, delisting from the Tel Aviv Stock Exchange. In June 2017 the China Securities Regulatory Commission approved the acquisition of the remaining 40% of shares by ChemChina, making it the sole owner of the company through its Hubei Sandona Co. Ltd. subsidiary. Since August 2017 Adama has traded on the Shenzhen Stock Exchange and in January 2018 was included in the Shenzhen-Hong Kong Stock Connect. ^ Editorial, Reuters. "Adama says Chinese regulator approves merger with Sanonda". U.S. Retrieved 2018-11-26. ^ "Bloomberg - Are you a robot?". www.bloomberg.com. Retrieved 2018-11-26. ^ "Adama trades shares on Shenzhen-Hong Kong linked exchange". Agrow. Retrieved 2018-11-26.